Benedict Preece is principally a conductor, passionate about working with both singers and instrumentalists. 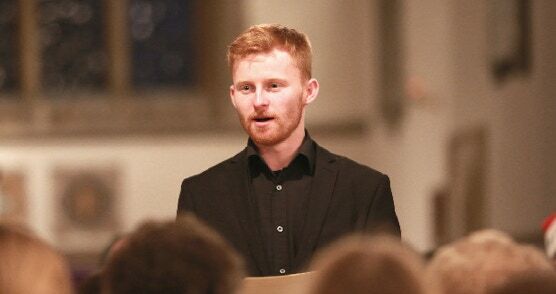 He is currently Music Director of Caritas Chamber Choir, East Bridge Chorale and Sandwich Concert Band He has recently been appointed Head of Keyboard and Organist at the Duke of York’s Military School, Dover. Benedict was the 2017 - 2018 Genesis Sixteen conducting scholar with Harry Christopher’s distinguished ensemble, the Sixteen. You can learn more about The Sixteen by visiting their website at thesixteen.com or their Facebook page. Ben’s “other” choir is Caritas Chamber Choir; for more about Caritas click on the logo, or here. Another of Ben’s projects is the Emerging Composer Competition. You can read more about here. Benedict began his career as a Chorister of Canterbury Cathedral and continues to sing in the choir as a Deputy Tenor Lay Clerk. At Trinity College of Music, London, he specialised in horn and natural horn under tutelage of Roger Montgomery and subsequently with Anthony Halstead. As an organist, Benedict studied with Dr. David Flood and both organ and composition with Neil Wright. A keen composer, many of his choral works are performed by Caritas as well as choirs from Sweden, the Netherlands and the USA with whom he has developed strong links. Benedict has developed his orchestral conducting technique with Stephen Portman (a former student of Monteux and Szell) and on Peter Stark’s renowned courses. He maintains a busy schedule with all his ensembles. Caritas Chamber Choir is regularly engaged to deputise for Canterbury Cathedral Choir in holiday times. In a year, the choir sings 25 services and 13 concerts, raising funds for a variety of charities. Recent performances have taken place in Lille Cathedral, The Netherlands, Sweden (with Hagamotettkör) and, last October, in Madrid. The final of the Caritas International Emerging Composer Competition was held at the Colyer-Fergusson Hall in July 2018. Swedish conductor Ragnar Bohlin was judge, selecting Peter Bajetta’s Snow as the well-deserved winner.